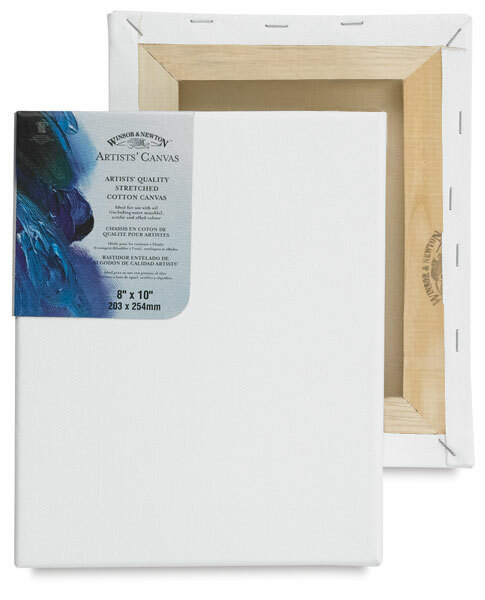 Artists' Canvas from Winsor & Newton is a range of back-stapled, 13/16" profile stretched canvas that is manufactured to the highest quality standards. Made with heavyweight 8 oz natural cotton duck, these canvases feature a medium grain surface. They are ideal for all techniques, including heavier applications of color, and can be used with oil, water-mixable oil, acrylic, and alkyd paints. Artists' Canvas is triple-coated with acid-free sizing and two coats of highly pigmented acrylic primer specially developed by Winsor & Newton. Balanced absorbency and tooth prevents sinking of oil colors and improves adhesion. These canvases feature frame construction with kiln-dried, ¾" stretcher bars. Tailored corners and excellent tension are achieved by hand stretching each canvas. In addition, ample canvas on the back allows for restretching. The 13/16" (21 mm) deep, staple-free edges can be painted to display finished paintings with or without a frame.